As I’ve confessed before, container planting isn’t my strong suit. Occasionally I get a burst of inspiration, but more often I consult my colleague Kripa here at Landscape Projects, who is a genius when it comes to putting together gorgeous pots. 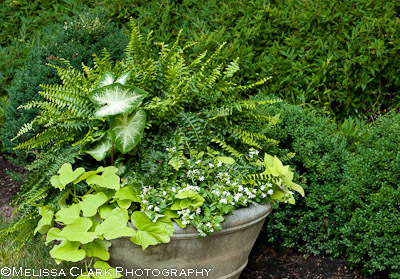 Here’s a sample, for a shady garden, which she created recently primarily using annuals we already had on hand. I could look at this all day. I wish it were in my garden. I love the simplicity and elegance of this design, created for a client who prefers only white flowers (with a touch of blue permitted – see the next photo). The backdrop is a Boston fern from a ten-inch hanging basket (not hardy in the garden but gorgeous for summer), accented by Caladium ‘Ghost’ in front. White Scaevola and chartreuse Ipomaea ‘Sweet Marguerite’ (sweet potato vine) round out the composition. All the plants are shade-tolerant. In a matching container not far from this one, white begonias joined the party, but I didn’t get a good shot of that one – it was in a sunnier area and the light wasn’t good. But trust me, it was just as beautiful. In another part of the garden, Kripa played a variation on the white and green theme, adding just a touch of blue Lobelia. After only about two weeks, this is filling out nicely. 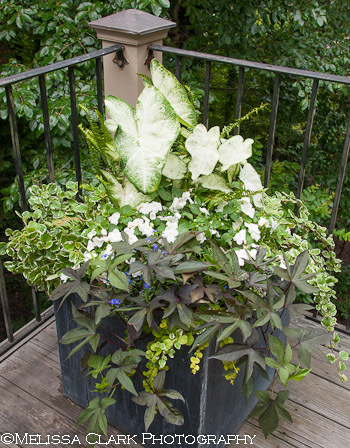 In addition to the Lobelia, she used Caladium ‘Candidum,’ Swedish ivy, white impatiens, some golden creeping Jenny, and Ipomaea ‘Blackie.’ Oh yes, and another Boston fern (smaller this time). The client was thrilled – instant elegance and beauty, and all she has to do is water! Of course, you can bring color into your shady area containers or back yard with annuals like coleus. Last summer I had a container on my deck where I took that approach, which I wrote about here. Of course, these were in the sun, but they would have worked in the shade as well with maybe just a few adjustments to the coleus I used. The shade planter at the foot of my deck. The white flower hanging down over it is from a Ligustrum shrub. What’s that lovely caladium named, I’m sure many of you want to know? So do I. The plant tag just said, “Shade plant.” On my way to my car two other gardeners stopped me and wanted to know its name and where I’d gotten it, but I had bought the only two on the shelf. It’s a dog-eat-dog world out there when you’re decorating a shade garden. I may not have Kripa’s talent, but I think I made up for it in sheer luck. Update: Jen’s comment below prompted me to do some Internet research. 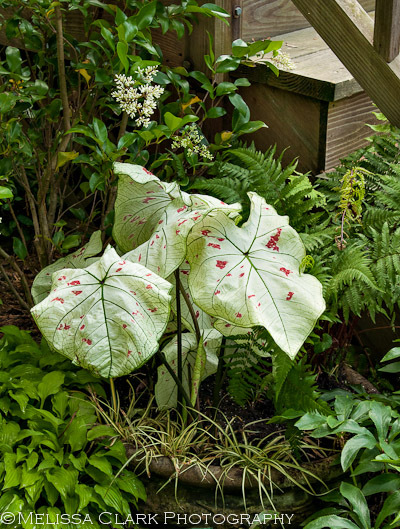 The full Latin name of a caladium is apparently Caladium x hortulanum, but with a little sleuthing I discovered my find is a variety called ‘Cranberry Star.’ My thanks to Jen, for spurring me to work a little harder. Now if I can only replicate my luck next year!